The wineries of El Dorado County and neighboring Amador offer something unique every time you venture into the scenic landscape of rolling hills and sun-bathed vines. Impromptu barrel tasting with the winemaker? Why not! Nestled in the pine trees slightly above Placerville, Miraflores beckons with its serenity and Old World charm. The tasting room is appointed with many recycled and salvaged elements, striking a perfect harmony between country rustic and European flair. Bottling the surrounding terroir amongst 40 acres of estate vines, Winemaker Marco Capelli has crafted small-batch, artisanal wines with Syrah and Zinfandel hogging the spotlight. The remaining 214 acres of the property have been left untouched to retain the natural beauty of the Sierra Foothills. At Miraflores, there is an emphasis on indulgence and experience. Throughout the summer, attend a weekend pairing event on the vineyard patio, which showcases the winery’s offerings alongside culinary delights prepared by a plethora of distinguished chefs, such as Allez’s Christian Masse. Also noteworthy: Miraflores pours a whopping five different varietals of sweet wines. 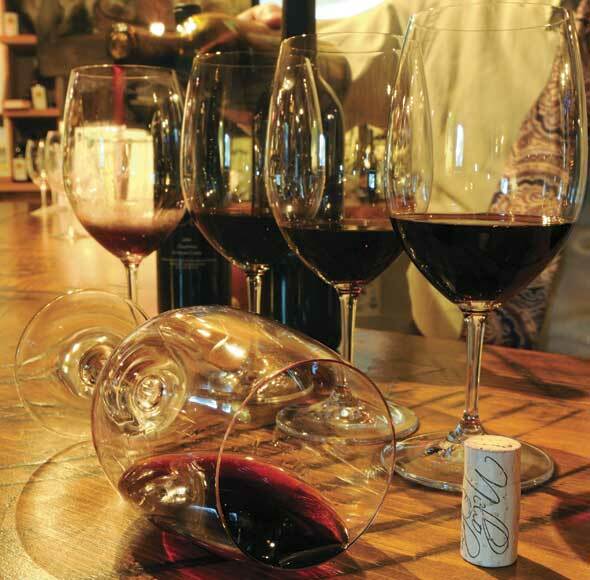 Zinfandel 2006: This afternoon sipper scored 90 points from Wine Spectator. Aromas of raspberry jam and black pepper with a soft and smooth feel in the mouth. Botricelli 2008: The white Bordeaux Semillon/Sauvignon Blanc blend is treated with the mold Botrytis cinerea to create a golden honey nectar. Notes of apricot, citrus and crème brulée. Try with blue cheese for an amazing treat! A quick jaunt to the neighboring Fair Play region will bring you to TooGood Estate and Wine Caves, which is famous for their fun and flirty labels such as Who’s Your Daddy and Zin Chic. Designed by Owner Paul Toogood himself, these artistic bottles will add sass to any collection and most likely be kept long after the contents have been enjoyed. Navigate through the 5,000 square feet of wine caves to enjoy a barrel tasting as well as the full lineup of vintages; no reserve wine here. Note the private Grand Cave Dining Room that seats up to 20 as well as the new event space, currently in the works, which will house a small kitchen in addition to a viewing deck to bask in the scenic vines. And don’t let the $5 tasting fee deter you, as it often includes lunch as well as a keepsake glass to enjoy your day’s bounty at home. 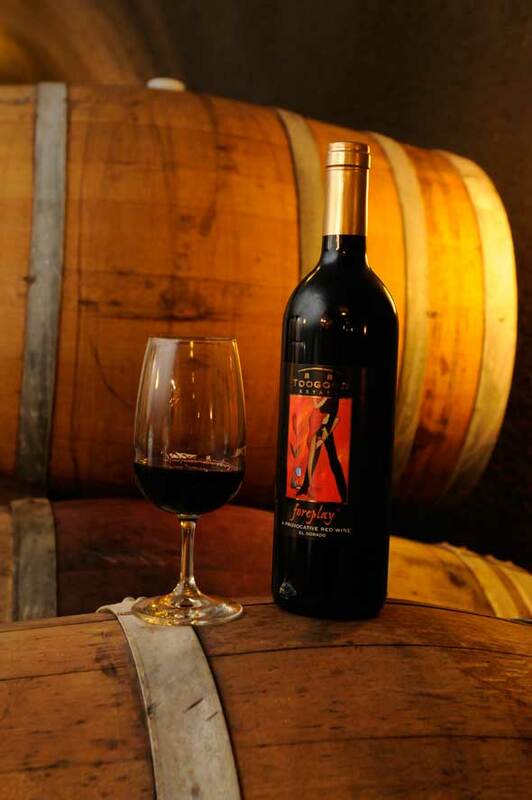 Foreplay VIII: This provocative blend of Cab Franc, Malbec, Cabernet and Merlot has been perfected over its last eight vintages. Black currant, mineral and cigar box aromas with sun-kissed fruit and herbs on the palate. Dry Muscat Canelli 2010: The perfect summer porch wine with a unique dry style. Perfume on the nose with notes of Asian pear and honeysuckle; hints of peaches and coriander on the palate. Before you head out for a day of wine tasting, you can have a really fabulous picnic lunch planned in advance by pre-ordering a Box Lunch, Basket Lunch or Wine Country Platter Lunch from Chef Beth’s Amador Vintage Market & Deli at 9393 Main Street in Plymouth (amadorvintagemarket.com). Not too far from Terra d’Oro (Sip Stop #3), Amador Vintage Market & Deli is a quick stop to pick up anything from gourmet sandwiches (no pre-order necessary), snacks and fresh salads to desserts and coffee. With a taste for nothing but the best, Style recommends the aforementioned “Platter Lunch,” which includes lemon-rosemary chicken, balsamic roasted pork, seasonal grilled vegetables, Vintner’s Garden Salad, a country olive mix, rustic bread and butter, and a selection of cookies, brownies and fresh strawberries. This cornucopia of goodness will wipe out your wine-tasting munchies in no time, and best of all you can enjoy it amidst the surrounding beauty of vineyards. 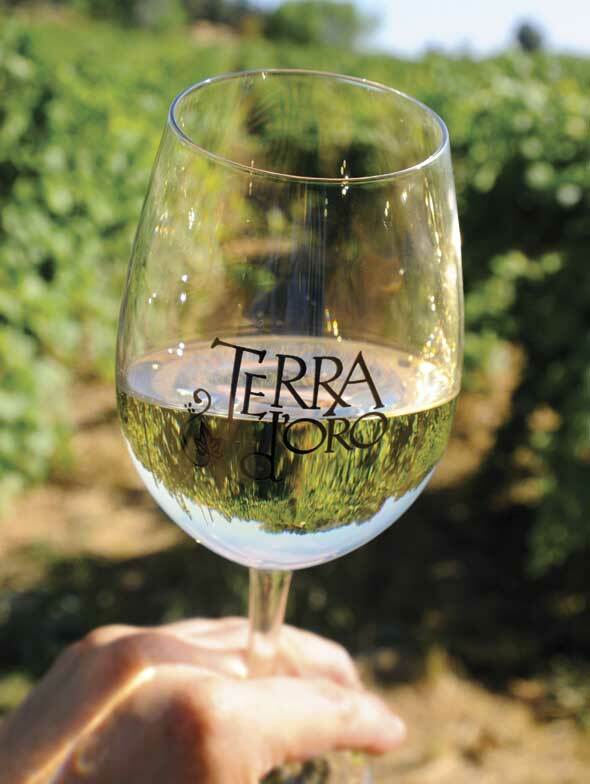 The first vineyard (under their Montevina label) to produce in the area since prohibition ended, Terra d’Oro is passionate about robust, single-vineyard Zinfandels – contributing to its reputation as a Zin pioneer. General Manager Jeff Meyers has brought the European growing style to the region by practicing sustainable farming, integrating pest management and varietal cloning in his 400 acres of estate vines. If you’re visiting Friday to Sunday, be sure to join one of their free tours embarking at both noon and 2 p.m. You’ll get a chance to see where all the magic happens: the fermentation tanks, the impressive barrel room with the capacity to house nearly 7,000 barrels, as well as the bottling room which will surely invoke a Laverne & Shirley moment. Also noteworthy: the tasting room offers an array of wine accessories and food items…perfect for the hard-to-shop-for! SHR Field Blend Zinfandel 2006: This “sexiest wine ever made” won Grand Champion in Pittsburg California’s Zinfandel Competition in 2010. Clove, vanilla and violet bloom on the nose while bold dark fruit and mocha warm the palate. Forte “Super Tuscan” Blend 2008: Blend of Sangiovese and Cabernet; deep and rich forest floor on the nose with a woven fabric of fruit and spice on the palate. Dominated by cherries, rhubarb, nutmeg and orange peel. Housed in the cellar of one of Placerville’s top restaurants, Sequoia, Nello Olivo can be a seamless end to your wine tasting adventure as not only is it open late (daily until 7 p.m.) but once you have tasted at the quaintly rustic wine bar, you may bring your selection upstairs to enjoy with dinner. Owner Nello Olivo, planting his vineyard in Cameron Park with over 4,500 vines, also paired with Winemaker Marco Capelli to create clean, well-balanced wines that would please the perceptive palates at a restaurant. Pouring only one white varietal, the focus is on the reds; and in its first year, the winery has won 27 awards, including Best Sangiovese of California. You’ll most likely get the opportunity to chat with Olivo himself while tasting and hearing stories about the historic Bee-Bennett House. The wine cellar contains a private dining room and hosts special food pairing events such as “Tasty Tuesdays” which are free to Wine Club members. Sangiovese 2007: Won Best Sangiovese of California. Dark cherry, white pepper and woodsy mushrooms on the nose with blackberry, chocolate and hints of herbs on the palate…a lingering finish. Toscanello 2007: Platinum Winner; blend of Sangiovese with Merlot and Cabernet. Aromas of blueberry, cigar box and eucalyptus with a clean and steady finish. A great wine for aging. With easy access to Highway 50, this relatively new winery in Shingle Springs, opening its doors May of this year, is another not-to-miss spot to wrap up (or start out) your wine tasting day in El Dorado County. Owner Bill Manson took over the 20-acre estate (formerly known as Sogno) and among his many updates, removed most of the deteriorating Zinfandel vines and replaced them with more obscure varietals native to the Northern Mediterranean rim, such as Vermentino, Arneis and Carignane. 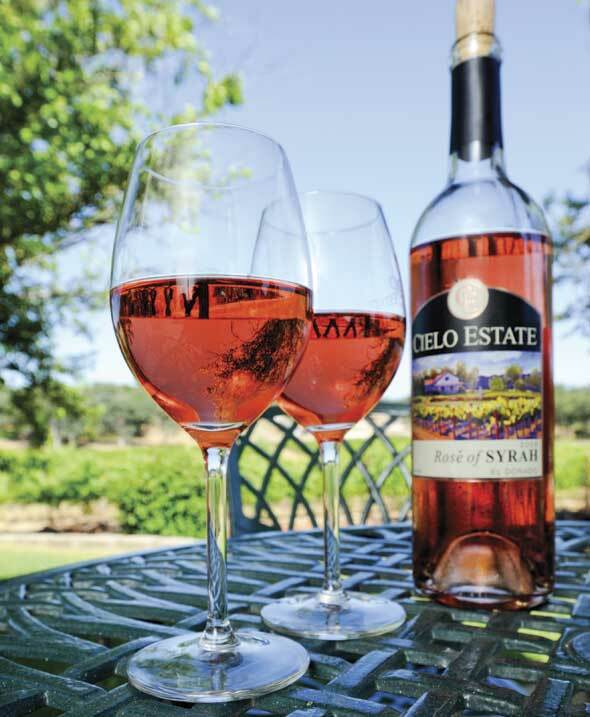 With Winemaker Mark Fowler, Cielo Estate has achieved its goal of returning to the roots of winemaking with value-priced vintages ranging on the spectrum from rustic to elegant. The atmosphere here is casual; noses are in the glass not the air as you’re encouraged to enjoy the scenic grounds. You’re certain to return to attend one of their Friday Night Concerts, as music has never sounded as good when paired with a glass of vino and the fresh mountain air. Marsanne 2009: Full-bodied Rhone varietal that packs a punch. Aromas of citrus and almond with pear, quince, golden caramel notes and Parmesan cheese on the finish. Petite Sirah Reserve 2009: A big, inky wine with legs for days; known as the “Purple Teeth Stainer.” Fruit forward with black pepper spice on the nose and plum, fig, date and eucalyptus on the palate.